In the past, I have been critical of Mike Scioscia’s ability to create over 100 different lineups in a single season. I believe that consistency in the lineup creates strength, and constantly juggling the lineup only leads to lesser performances. 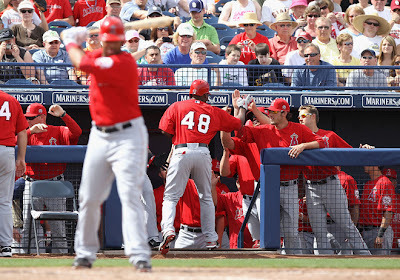 But, if ever an Angels’ team appeared to be destined for numerous lineups, it’s the 2011 team. With so many players battling for positions, and making deserving cases to be on the Major League club, it seems that Scioscia will be the perfect manager to maximize their potential. However, before Scioscia can figure out how to create another 100+ lineups, he first will have to decide which players to keep on the 25-man roster. Thus, a battle royale is underway during Spring Training. For purposes of this article, we are going to assume that the Angels will open the season with 12 pitchers on the roster (a good move given the need for more bullpen help at the start of the season), and that Kendrys Morales and Reggie Willits will both be healthy enough to start the season on the 25-man roster (both are not necessarily guaranteed at this point). If any of these assumptions change, more spots will open up. With those assumptions in mind, the Angels have three main areas where they need to make some difficult roster decisions: Bullpen, Catcher, DH, and Third Base. As it stands right now, Downs, Rodney, Takahashi and Walden are all essentially guaranteed spots (due to historical performance or nature of their contract). While there is some debate amongst fans as to who the closer should be, at this point, based on Scioscia’s past, Rodney will be given the shot to close. He will have a leash—albeit a short leash—while the Angels groom Walden to take over the role long-term. While Downs could close in a pinch, the better use for Downs will be as the setup man working in the 8th inning. And, while Jepsen may have the stuff to close, with the depth that the Angels have for future closers, the best use for him may be in a trade. Since Kazmir is such a big question mark for the rotation, one of the three remaining bullpen spots should go to a long-man. The odds of Kazmir having to leave a game early forces the Angels to carry another long-man. While Takahashi has the ability to pitch long relief, the Angels may need him for a spot start in case they want to still show a lefty in the rotation and don’t want to start Kazmir. So, that means one of the final bullpen spots should go to either Bell or Palmer. Between the two, Bell has certain advantages over Palmer. While neither is off to a great start in Spring Training, the historical differences between the two make the choice clear. Last year, in Bell’s first full year in the Majors, he gave up 3.1 walks per 9.0 IP, whereas in Palmer’s best year (2009), he gave up 4.1 walks per 9.0 IP. Similarly, last year, Bell struck out 6.6 batters per 9.0 IP whereas Palmer at his best only struck out 5.1 batters per 9.0 IP. Given the stark differences in numbers, and in age (unfortunately Palmer is on the wrong side of 30 and has suffered injuries whereas Bell is 24), the Angels should break camp with Bell instead of Palmer. That leaves two bullpen spots remaining for Bulger, Cassevah, Jepsen, Kohn, Rodriguez, and Thompson. Both Bulger and Thompson are out of options and must be kept on the 25-man roster or else exposed to waivers—where they would likely be taken. Both in the past, and in this Spring Training, neither Cassevah or Rodriguez have been overly dominant. While both have had tastes in the Majors, I believe that they are further down on the depth chart than the other relievers. So, that leaves two spots for four players. Of the four remaining candidates, both Thompson and Kohn have emerged as standouts both last year and during this Spring. Thompson’s career really took off last year with the addition of his cut-fastball. And Kohn, after a rough introduction to the Majors against Boston settled down nicely for the rest of 2010 and did not allow a homerun in his entire time in the Majors (in 21.1 IP). Furthermore, looking down the Angels’ organization, the Angels have plenty of hard throwing relievers (Geltz, Tillman, Bedrosian, McKiernan, and Scholl) as well as Jeremy Berg who can truly alter the opposition’s sight lines with his sidearm delivery and soft control. The Angels can afford to trade or lose Bulger and Jepsen, and potentially could use one or both to shore up other needs. Believe it or not, catching is not an area of strength for the Angels and definitely not an area where they should make a trade. While they do have potentially three Major League catchers, after that, the depth chart has several question marks. According to AngelsWin.com, the next best catching prospect in the Angels’ system is Carlos Ramirez (29th on the list)—and he’s most likely going to open the season in Single-A. Should anything happen to Mathis or Wilson, the Angels will need another Major League catcher—and that means that they need to hold onto all three players for this year. While Conger has looked improved behind the plate, he has not looked overly confident at the plate. At this point, the Angels need to get him into an offensive groove at Triple-A so that he can be ready in the event that they need him on the parent club. Considering how often catchers get banged up, there’s a fair bet that Conger will be in Anaheim at some point by the middle of the season. But, until then, expect Mathis and Wilson to split time behind the dish (and with his svelte new figure, expect Wilson to play at least 1/3rd of the games). With nearly half the Angels’ homeruns in Spring Training, Mark Trumbo is really making a strong case for himself (Trumbo has 5 of the team’s 12 HRs as of the writing of this article). The problem is where to play him. While every day that Kendrys Morales doesn’t play makes it more likely that Trumbo will be the Opening Day first baseman, eventually, Trumbo will have to find a spot to play. That place may be as the team’s part-time DH. There’s no doubt that 2010 was a subpar year for Abreu. Not only did his skills in the field decline, his skills at the plate also took a noticeable hit. While I’m hopeful that Abreu will return to his career norms, the Angels need a powerful bat on the bench and to use against lefties, against whom Abreu struggled. That means that Trumbo should make the team. While it would be nice to think that the Angels could use Trumbo to keep Abreu’s option from vesting, I doubt that they would do that. A resurgent Abreu would be too integral to the Angels’ offense to keep them from doing that. Batting Abreu second in the lineup would give Hunter, Morales, and Wells plenty of runners to drive in—especially if Abreu gets his OB% back up to .400. They will give Abreu every chance to prove that last year was a fluke. Knowing how Scioscia can juggle the lineup, he still will be able to find 200+ ABs for Trumbo over the course of the season by giving Morales some relief at 1B, Abreu some relief at the DH spot, and maybe a spot start later in the season in RF. If Trumbo can continue to rake like he has in Spring Training, he will earn the playing time legitimately, and then the Angels could consider trading Abreu at the July deadline to clear the spot for Trumbo long-term. But for now, Abreu has shown that he should be the starting DH. The last position that the Angels need to solidify is third base. Unfortunately, none of the candidates vying for the position—Callaspo, Izturis, or Wood—have shown anything special in Spring Training to warrant winning the position outright. With each of those players there are several major concerns that make each of them seem unlikely to win the position outright. Callaspo lacks stellar defense or power. Izturis lacks the ability to stay healthy for a whole season. And Wood’s ability to hit Major League pitching is still a big question for the Angels. With Callaspo still demonstrating a lack of power this Spring, Izturis still demonstrating that he is too fragile to play an entire season, and Wood still making questionable contact at the plate, it’s time for the Angels to look outside the organization for help. The ideal player would be a left-hander with power. Luckily such a player exists and could be available: Alex Gordon. While it’s easy to argue that Gordon is similar to Brandon Wood (as a failed 3B prospect), there are several key differences between the two. While Gordon’s average dropped off to .215 last year, he still walked nearly 10% of the time he came to the plate. That suggests that if he improves his BA, his numbers will become very respectable. More importantly, against the A.L. West, Gordon has gone 46/164 with 7 doubles and 7 HRs over the past 3 seasons. The Angels could use that kind of production in their lineup, especially from a left-hander. In order to get Gordon, the Angels should offer the Royals Jeremy Moore and Kevin Jepsen. While the Royals’ farm system is stocked with talent, it is a bit weak in outfielders—especially in the upper levels of their minor leagues—and in bullpen help. As a small market club, the Royals might be interested in trading for an OF prospect who could emerge with all their other prospects to establish a potent and affordable offense. Moore, a potential 20/20 OFer , would fit in nicely with their team. And, the Angels could afford to trade Moore as their Major League outfield is full and there farm has plenty of talent in development. With Alex Gordon manning third base, Scioscia could still get Izturis into 100 games (assuming he stays healthy) by giving him 50+ starts at 3B, 20+ starts at SS (to give Aybar rest) and 20+ starts at 2B to keep Kendrick rested. This will keep the entire infield well rested throughout the season and would allow Bourjos to develop into the future leadoff hitter. And, it means that Callaspo, who has yet to show any power this Spring, becomes the backup infielder for 3B and 2B. As for Brandon Wood, he should be traded to a team that can give him another shot with less pressure. He has all the talent to succeed, and I would like to see him do so. Unfortunately, I do not believe that he can achieve success in Anaheim. There’s one last battle, that’s interesting to watch, but the outcome is not really in question. That battle is for the 4th OF spot. While the job is Willits’ to lose, it’s been a pleasure watching how Chris Pettit has been performing this Spring. In 2008, AngelsWin.com ranked him as the #9 prospect in the organization. Unfortunately, years of injuries have hampered his development to the point that by 2011, he wasn’t ranked by AngelsWin.com in the Top-50 Prospects. Unless Willits is unable to start the season, Pettit will be sent down to Triple-A to prove what he can do over the course of a season and to show that he can remain healthy. However, watching Pettit play should remind fans just how difficult it is to make it into the Major Leagues. Not only does a player have to have the skills to succeed in the Major Leagues, he also has to have the good luck to remain healthy during his development and the good timing to emerge when there is a space open for him on the parent club.